Lalita uses mSakhi to counsel Sheela Devi about her granddaughter, Aaradhya, 2.5 months old. Sheela Devi had to walk for about half an hour to bring the baby for vaccinations, including Penta-1 and polio. Photo by Rahul Kumar for IntraHealth International. Lalita Chauhan starts her day early to the sound of an alarm from her phone. A couple of years ago, she could not have imagined starting her day in such a high-tech way, much less owning a smartphone. As an ASHA (or accredited social health activist) in rural India, Lalita and other community health workers are benefitting from the country’s Digital India initiative, whereby the national government is transitioning paper-based services to digital platforms to make public services more accessible to communities. Her new smartphone is a result of this, and her confidence in using it comes from technology training from IntraHealth International. 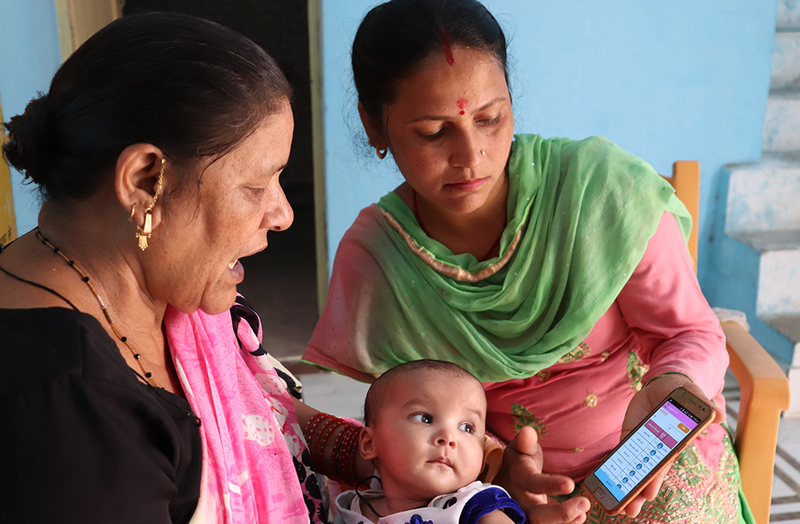 IntraHealth is helping the state of Uttarakhand leverage the national campaign to improve primary health care at the facility and household levels, in part through its mSakhi digital application for Android smartphones. Now Lalita can pull up real-time status reports for any client, any time on her phone. To help ASHAs transition from paper records to digital, IntraHealth taught Lalita and her colleagues how to use their smartphones for data collection, skills building, and health promotion. The training also introduces them to new ways to use technology in their everyday lives, such as setting up calendar alerts and wake-up or reminder alarms, as well as communicating with family members and colleagues. “Hum to abhi whatsapp kar dete hein,” Lalita says—“Now I just WhatsApp.” She can now connect to her friends and relatives instantaneously, she says. The mSakhi program in Uttarakhand began with baby steps in 2016. For two months, ASHAs and auxiliary nurse midwives were trained in smartphone basics—how to use the Android phones, their features, and different popular apps. Then they learned to use mSakhi for health service delivery. The data health workers enter into mSakhi are shared among each other and feed into a dashboard that aggregates the information and tracks improvements or gaps in primary health care delivery across the target community. Lalita says her responsibilities as a frontline health worker have set her free from the monotony of household chores and have helped her pursue a dream of being a professional and earning an income for her family. She takes pride in her mastery of these new technologies, and her ability to access data and demonstrate her knowledge to her clients, building their confidence in her professionalism. Previously, when Lalita used a weather-worn notepad to track clients in the 250+ households she visits in her area, she missed appointments or lost patient histories in the pages and pages of notes. The records were difficult to organize and impossible to follow over time. Now, Lalita says, she does not need to remember every bit of this information, because mSakhi does it for her. She can pull up the real-time status report of any client at any time right from her phone, and easily send reports to her supervisors. The percentage of women who delivered without having had any antenatal care visits dropped from almost 70% to 3%. Last month, Lalita took us to visit one of her clients, a young woman pregnant with her first child. As we sat down on the earthen floor, Lalita promptly pulled out the client’s antenatal care details and started asking about her health conditions. Lalita scrolled through the app’s interface, eyes fixed on the details as she counseled the pregnant woman on the benefits of proper rest, healthful meals, and timely iron and folic acid tablets—punctuating her points by showing her client pictures from the mSakhi app. At one point, she opened the counselling section of the app and held the phone close to the client so they could both hear the automated voice giving examples of healthful behaviors toward a successful birth. Occasionally, Lalita paused the audio and added her own explanations. IntraHealth first developed mSakhi in 2012, and has adapted it over time to support frontline service delivery in a number of states and to fit priority needs. mSakhi is new to Uttarakhand. After almost two years of rigorous people-centered design, adaptation, and implementation, the app has begun making its mark on health worker behaviors and on health service delivery. The percentage of pregnant women who delivered without having had any antenatal care visits has dropped in the project’s target area from almost 70% to just over 3%. The percentage of pregnant women who completed all four antenatal care visits prior to delivering rose from 21.7% to 55.3%. mSakhi has created a real-time information exchange platform. Lalita’s story is just one example, but it is very common among the 137 ASHAs working in Dugadda district’s mSakhi project in Uttarakhand. mSakhi has created a real-time information exchange platform, on which responsive decisions can be made and people-centered care becomes possible. Lalita quips that now she’s waiting for the app to make her child do her studies on time. Her daughter, Himani, is in her final years of schooling, and is Lalita’s biggest fan. She dreams of becoming a doctor in the nearby facility, she says, so that she can follow her mother’s example and serve her community. On immunization day at the Sitabpur Panchayat Bhawan in Kotdwar, Lalita and other frontline health workers provide services to women who have come to get their children vaccinated. Photo by Rahul Kumar for IntraHealth International. Lalita speaks with Meenakshi Rawat, the Pradhan (elected local leader) of Sitabpur, and her husband, Dinesh Rawat. The entire family has come for MR vaccination for their children. Sitabpur has high levels of literacy and people generally come forward to get their children vaccinated. The family tells us that people are accepting of gender equality and keeping the family size small. Photo by Rahul Kumar for IntraHealth International. Lalita at home with her husband. Photo by Rahul Kumar for IntraHealth International.